For multiple parties. Multiple years. And you can see that the ultimate goal is to make it so your employees talk to all their friends and say you, as a boss, are the cream of the crop. Employees love you. Because your parties have an open bar. Your bar, whatever it may be, will have these custom bottle openers reminding all your employees that their ability to unwind, chill and enjoy a night for free is all on you — which makes you the best company to work with in the entire universe. You don’t need a lot of them either. Three or four — maybe five — is fine. Keep them stocked. Of course, they’re branded. Beautiful. And your parties will be the hit of the night. You instill devotion, pride, and true loyalty. That’s worth the cost of a few custom bottle openers. So What Are You Waiting For? Those Beer Bottles Need Opening. Just contact us at BRAVA Marketing. Don’t wait. You can view all the designs we have right now and see which ones may suit your fancy. Take your pick, make an order or two, and your business has grown. Pop open a few bottles, celebrate your year-end close-out with some bonuses due to heavy profits from your business and call it a night. Think about how important it is to have a presentation as a bartender. Even better, a presentation as a club. Or restaurant. Or, simply put, a bar. The establishment itself is just one big marketing campaign. A brand development in place to garner the attention of potential customers. Makes sense since the main source of revenue of those establishments happens to be return customers! They’re called “regulars.” The ones who keep coming back, because they like the atmosphere. The bartenders. The waitresses. The employees. The good feeling of hanging out, having fun, drinking, and maybe eating some chips. It then makes sense that the one thing you need to do is brand everything in your establishment with your label, your company name. 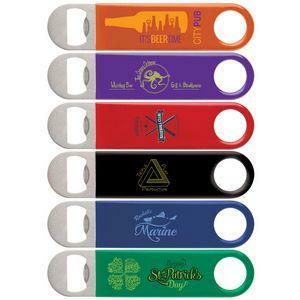 Why not branded bottle openers? They’re used all the time. Bartenders offer instant advertisement just by using those branded bottle openers right in front of customers at the bar, and you don’t even need to pay for it every time they’re used! It plants an image in the brains of these customers who then associate the service with the name. 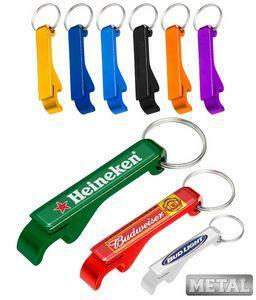 So why not get some branded bottle openers for your business? As a bartender, get some of those bottle openers in your name — and become a celebrity bartender mixologist! Makes sense to me. You’re already here, obviously. Why not explore the many designs we have? Then contact us right away, and we’ll see what we can do for you. We’re all about supercharging your brand and making your name well known among the masses of those who love their alcohol and fun times. Be a household name. Right here. Right now.